When did the phrase “witch” become an insult? How is it denigrating to accuse someone of having all-out magic powers? It’s like saying, “I don’t like you, so I’m going to imply that you could literally turn me into an amphibian as easily as I could open a box of cereal.” Strange priorities that we have, aren’t they? Truth is, we’d give our front teeth to be a witch. They’re usually good to let things slide so long as you don’t do something outrageous like drop a house on their sister. A typical witch is content to just brew things at home, conjure up familiars, make occasional trips to the store for eye of news and other witching accessories, and polish her broom handles. Sure, there’s an occasional curse to be done, but admit it -- even the best of us would curse someone now and then if we could. It’d be much more effective than the hand gestures we’re used to using in traffic, that’s for sure. We say becoming a witch would constitute a big step up in life, and out Ember Witch Costume will help you get there. 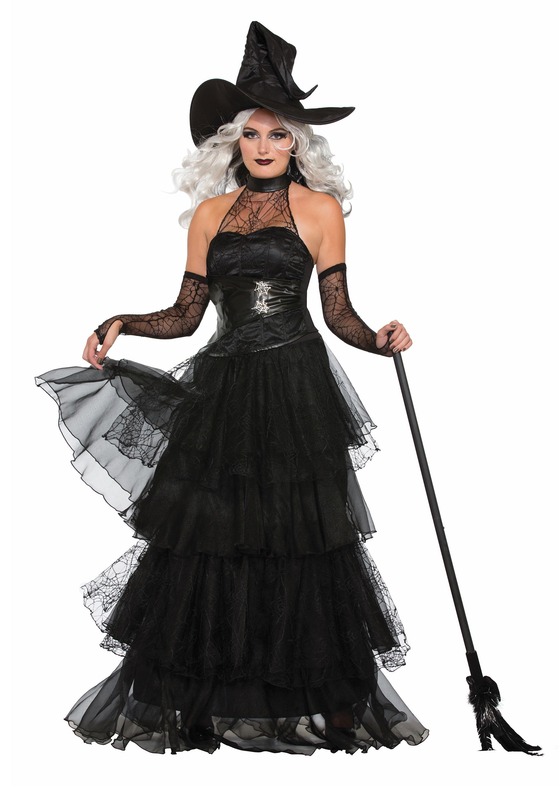 Its lacy neckline and spiderweb details will make you the most fashionable member of your coven, and the silky flowing skirt will make you a haunting figure indeed. Just don’t take the witch lifestyle too far -- gingerbread is a terrible home construction material, especially in the south. The size actually runs a little big. Will wear a belt with it. Very cute flattering style.